Q – Is the IMS like the IBM and the SAM? The International Magicians Society was established in 1968 by Tony Hassini and currently has over 37,000 members making it the world’s biggest magic club according to the Guinness Book of World Records. I’m even a member! Unlike the International Brotherhood of Magicians or the Society of American Magicians, it’s not affiliated with FISM, there are no meetings, no annual dues, no newsletters, the website is rarely updated, and you can never resign. Q – How do you join the IMS? It costs $50 which includes lifetime membership and a free DVD. According to the website this gives you access to their magazine (which seems to have ceased publication many years ago) and the ability to buy DVDs from the IMS. Q – Who won the first Merlin? The earliest record we have of anyone winning a Merlin are Tony Clark and Harry Blackstone Jr in 1996. Q – What is the Merlin Award? It sounds like the Merlin Award itself has certainly received a lot of great exposure as well. Q – If they have a banquet every three years, how come awards are given out every year? We have records of them holding banquet dinners in 1999, 2000 and 2003. To make it even more confusing, the 2003 banquet was billed as the “17th Banquet Dinner”. Some say the Banquet is held every year. Tony Hassini, on the Merlin Award FAQ page, mentions it’s a “$500 per plate” Banquet. The next IMS Awards Banquet is scheduled for February 2010 in Las Vegas. Q – What is the voting procedure for the Merlin Awards? I don’t know any member of the IMS who has ever cast a vote. Of course, this may mean nothing as the website doesn’t say how many “voting members” there are – though the use of a plural term implies there must be more than one. As far as starting off with “approximately one hundred names” this could be difficult in categories like: ‘Longest Running One Man Off Broadway Show’, ‘Malaysian Multi Talented Female Entertainer’, and ‘Female Illusionist of the Year’. Some Merlin Award winners say they were nominated by colleagues and submitted videos to the voting members, some won Merlin Awards as prizes at the Amber Magic Convention in Latvia. Q – What is the criteria they are looking for? Yet they have presented many awards to TV Producers, magic historians, a knife thrower, and a ventriloquist. The IMS Award for Criss Angel’s Magic Set ‘Winner Best Magic Kit‘ was NOT a Merlin Award, but a certificate – according to Tony Hassini. Q – What are the categories? They seem to change all the time. In some years different people have won the same award, other times very similar awards. Every year brings new and exciting categories like ‘Best Magical Mentor of the Year’ or ‘Best Charismatic Magician’. Sometimes major awards like ‘Close Up Magician of the Year’ are not even presented. In 2005 nobody got ‘Magician of the Year’. The IMS FAQ page states: “I’m also asked how many Merlin Awards do we present per year. Since we are an international organization and have IMS Presidents in different countries, we try to consider as many countries and their magicians. There are over 200 countries in the world. It will be humanly impossible to present 200 awards a year. Therefore, we try to narrow it down to approximately 30 countries and their magicians per year. Sometimes, there might be two or three magicians from each country. Q – Are the Merlins really “the Oscars of magic”? They look like an Oscar. Perhaps, if the Oscars were not televised, were decided on by one man, were randomly given out throughout the year for promotional purposes only – you could then say the Merlin Awards were the Oscars of magic. Q – Did David Copperfield really get a Merlin? Q – Are magicians proud of their Merlin Awards? David Copperfield doesn’t have his listed on his website. Brett Daniels (Magician of the Year) and Jason Byrne (Best Cabaret Magician) don’t list them on their sites under awards either. Most people in the industry realise they are not actually “peer recognition awards” at all, but marketing tools to gain attention. However many in the magic industry are against the Merlin Award saying it really belittles the “real” awards like FISM or the AMA awards where the winners are voted on by peers or a qualified jury. Q – Do people really just “buy” a Merlin Award? NOTE: We are not saying everyone “pays” for their Merlin Award. Many of the recipients as late as 2010 were genuinely given the awards with no fees to pay. High profile people who are able to help publicise the Merlin Award or enhance the prestige and credibility of the Award have received them, but in recent years almost anyone who has applied has been able to “win” a Merlin Award… as long as they can afford the “administration fee” – (Refer to the genuine email exchange below). I am Max Toth, the International Magicians Society’s Chairman of the Merlin Award Committee. You were recommended and sponsored by a Merlin Award winner, Mr. XXXXX from XXXXX, to receive the coveted Merlin Award for your incredible work in magic. Since 1968, the Merlin Award has been presented by the International Magicians Society as a recognition award. The International Magicians Society is listed in the Guinness World Records as the World’s Largest Magic Organization with over 37,000 members world wide. The Merlin Award to magic is what the Oscar is to the movies. It is the most prestigious award given in the world of magic. Your DVD with your wonderful performance arrived and we all enjoyed it. Certainly you qualify as a contender for XXXXX Magician of The Year. I’ll present the DVD to the Board of Directors and ask them to vote on it. Normally, there is a $2500 administration fee, which covers the cost of the Merlin Award statue, Mr. Hassini’s travel expenses, and his time away from the office. However, we’ll waive this fee, if the winning magician picks up the airline and hotel for Mr. Hassini, as well as provide us with approximately 5-10 minutes of footage that we can use with the rest of the Merlin Award recipients’ project. The IMS FAQ page says: “The other question I am asked is “Are there any costs to receive the Merlin Award?” First, I must say that the Merlin Award is not for sale at any cost. Regarding the actual out-of-pocket cost, this varies from situation to situation. There are three ways a magician can receive the Merlin Award. One is to attend our Merlin Award banquet dinner; this is by invitation only, after the recipient was voted to receive the Merlin Award. Two is to participate and win a Merlin Award competition in different countries, which is organized by IMS. And three is for us to travel to the magician’s country and present the Merlin Award to them in their own country. So let’s look at the cost of the first scenario, which is where the magician must obtain a visa from the American embassy to travel to the USA. He must purchase airline tickets, other travel related costs and fees, hotels, meals, and $500 US dollars per plate at the Merlin Award banquet dinner. In the second scenario, again the magician must travel to the event where the Merlin Award competition is taking place. He pays all of the same travel expenses as mentioned in the first scenario and pay for the entrance fee to the convention or to the competition, whichever applies. In the third scenario, where we have to travel from the USA to the magician’s country, either the magician or the magician’s producer pays for all of the travel expenses, hotels, meals, airlines, and other related expenses. 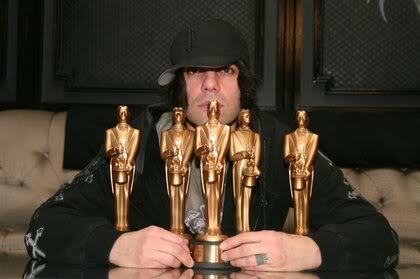 Q – Why has Criss Angel won so many Merlin Awards and David Copperfield only has one? I agree that the IMS, the awards it “presents”, and Mr. Hassini himself are all frauds. I really wish you the best in exposing this insult to the magic community. These “awards” are an embarrassment to our industry… period.